Are you looking for VCE Exam Suite and have trouble locating this product? No wonder! 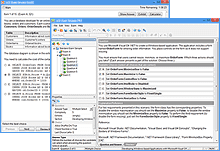 VCE suite, or VCE Exam Suite, is the name of the older version of VCE software solution, which has been enhanced and rebranded to VCE Exam Simulator. Just like VCE Suite, VCE Exam Simulator was developed to allow users to view, create and edit VCE (visual certification exam) files. So if you need to open VCE files to prepare for your IT certification exams, or have some exam information and want to share it in the form of VCE tests, VCE Exam Simulator will meet all your needs. What's the difference between VCE Suite BASIC and VCE Suite PRO? VCE Suite BASIC only includes VCE Player, while the PRO also contains VCE Designer, enabling users to create and edit their own VCE files. So your choice of the software solution will depend on your needs and what exactly you plan to do with VCE files. With both versions of the new VCE Exam Suite, you purchase your subscription, not the download. Therefore, when your subscription expires, you will not be able to play your VCE exams before you renew it. And once you renew your subscription, your VCE suite software solution will become operational again, and you won't need to re-install it.